I am back in Zambia after quite an eventful trip – not least of which was on my return finding I had acquired a temporary new pet – a large frog in my toilet! I am now however back in the routine of things and enjoying the “winter” sunshine. 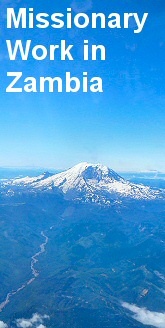 This is the season (April to August) the Zambians describe as the cold season. Nights can be chilly (as low as 8-10 centigrade), but the days are still in the mid-twenties and there is no rain now till October. I was intrigued by a dispute one of our workers was having with a builder who absconded with the money and had not completed the roof. He was eventually caught and put in prison on remand – not a pleasant situation, but it reminded me of other incidents of justice I had come across this last year which would be peculiar to Africa. Not long after my arrival, 6 years ago now, I heard of an incident where a young girl had been pushed into the road by her friends who were larking about, and had been unavoidably knocked down by a mission partner and his family. Instead of stopping to see how bad her injuries were, they simply sped on to the nearest police station, and handed themselves in, as they had been advised to do in their handbook. I thought this seemed a bit tough but was told that on no account should you stop if you caused an accident. This was verified in the most unfortunate way last August, when a lorry coming back from the Congo ran out of control and ploughed into 4 people, killing 2 of them. The driver was only a few miles outside the Zambian boarder, but he was caught by an angry mob and burned alive. This caused riots in Kitwe and Congolise traders kept a low profile for a week or so. Sadly, summary justice, or some would say mob rule, is fairly common here, but the rule of the law can also take unexpected turns. When I was in Kamatipa last year someone stole my purse as I was helping clear the ground for the football pitch. I cancelled all my credit cards never thinking I would see them again, but someone in one of the bars noticed a man acting like a king (buying everyone drinks) and rang his friend in CID. They arrested him and contacted me through my driver’s licence which was in the purse. I was very relieved to have my purse and cards back again but, of course, no money. I filled in a report at the police station and then was asked if I would like to see the prisoner. He was roughly handled and made to apologise to me for his crime. The next question was what I would like to do with him now. Clearly I am not yet fully Zambianised because I replied that now he was caught wasn’t it up to the courts to decide? Apparently not. I then suggested he could help clear the ground/do some work at play4all to clear his debt. No, because that had to be prescribed by a magistrate. I was on the horns of a dilemma. If I let him go I would appear as the soft touch musungu and encourage theft from play4all, if I said take him to court, he would no doubt receive a harsh sentence and prison as he clearly could not pay a fine. I rang the head of the volunteers and asked his advice. Let him go, - maybe he has a family. The CID seemed happy with this conclusion and said they would keep him an extra 2 nights in gaol just to let him know he has got off lightly. And what about the man who ran off with the roof money? The magistrate ordered that he stay in prison until he finished the roof. It took him about a week to do so, and the Chodort worker had to pay for transport for the man and a prison guard to the house and back each day. Somehow, I can't see that being a judgement in the UK! One thing I did notice last month when I was driving back from the airport, was how poor the maize looked. 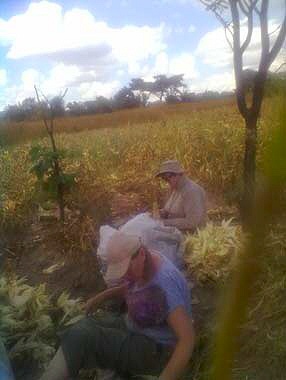 On chatting with people when I was home I discovered the crop had failed in Southern province, this was a compound of several reasons; partly due to the rains coming late, so the planted maize got off to a bad start. 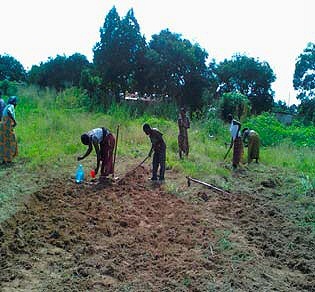 There was also less rain than expected this year (there is usually one good downpour a day) and the government did not give it's subsidised fertiliser out to subsistence farmers till early January, 2 months later than expected. This has caused a huge hike in the price of maize this year and those who have little money will struggle to supply this very basic food for their families. Another blow to the pocket has been the recent lifting of fuel subsidies causing petrol to rise at the pumps by around 12p a litre. We have yet to feel the knock on of a rise in transport costs and the cost of imported goods. For an enjoyable furlough where I made many new friends. For a safe journey home. For a dedicated team at Chodort. For the success of our proposals for Chodort's development. For Chodort Training Centre to flourish and continue to support vulnerable youths. For those whose crops have failed.